It’s another day at work and you’re hauling a load down the Pennsylvania Turnpike. Traffic is moving at a steady pace, you’re listening to your favorite trucking podcast and basking in the warm sunlight that’s hitting your windshield. Suddenly, there’s flashing sign, “35 mph. Slow down. TOLL PLAZA AHEAD.” A maze of brake lights flickers in the distance. Expensive toll roads can really ruin the moment, can’t they? Highway tolls are an expensive nuisance for any owner-operator or truck driver in the United States. But, like fuel, taxes and tires, highway tolls are another unavoidable cost of trucking. Toll charges average around $2500 per year for truckers. Different states have drastically different tolls which may make hauling a load even more expensive for you (or not). It’s important to have all the toll road information available before you start driving, so you won’t face any unpleasant surprises at toll crossings. Be aware of the costly routes and calculate them into your cost per mile before you hit the road. Which toll roads can truckers expect to hit their wallet the hardest? Can expensive toll roads be avoided? Not always. As a small business owner, you may have to bite the bullet and use the expensive highway routes. Sometimes there is no sensible alternative. Toll costs aren’t the only expense to consider. Forget about the short-term financial gain and think about your operating costs in the long run. When factoring in fuel for alternative routes, truck and tire deteriorations, delays and extra time, sticking with pricey tolls on highways and turnpikes may be the better option. 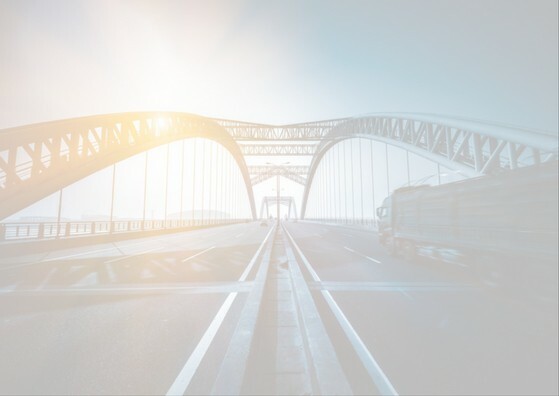 Your shipping routes may not align with the most expensive highway tolls listed above, but that doesn’t mean you’re in the clear. While certain state highway tolls are more expensive per mile, other states hit you with more toll road mileage overall, making it even more expensive for truckers to haul and deliver loads. You’re now aware of expensive tolls in the United States, but what states have the most miles of toll roads? If you’re a long-haul trucker, this list will not surprise you. Truckers passing through these 11 states are out of luck. The bad luck doubles in states such as Florida and Texas, who made our list for the most toll mileage AND house the most expensive toll roads. With so much road wrapped up in tolls, it’s tough to find a reasonable workaround. Then again, do you really want to drive down 1-95 in Miami during rush hour when you could just stick to the turnpike? Thankfully, not every state charges insane highway tolls. As a matter of fact, almost half of U.S. states don’t include any toll roads in their infrastructure. If toll-free driving sounds too good to be true, it probably is. Although these states don’t have any toll roads, roughly half still operate toll bridges, toll tunnels and toll ferries. You may never fully avoid paying highway tolls in America, but we hope our US highway toll overview map helps guide your route planning. And if you’re not already enrolled in a toll program, Florida’s SunPass or East Coast’s E-Z Pass, you should get on that. Expensive toll roads, vehicle maintenance, fuel and tire costs are all part of what makes being a trucker a pricey profession. Fortunately, freight factoring helps truckers get paid sooner – within 24 hours of delivery. What’s even better? Factoring companies provide fuel advances (up to 50% of the load amount) to help cover costs before delivery like fuel and road tolls. Factoring helps you get right back on the road, whether it be the most expensive or cheapest one out there. Dump truck driving can be extremely rewarding, but it’s not a job for everyone. If you’re looking into starting a career as a driver or owner operator, make sure you carefully consider the pros and cons of dump truck driving before making a decision. There are several things that make dump truck driving a perfect match for some and a less-than-ideal career for others. If you’re considering entering this career, keep reading. We’ve compiled a list of some of the advantages and disadvantages of being a dump truck driver. It’s a great place to start your research! Did we get your attention? Dump truck companies pay drivers on average $15.57 per hour. Certain companies will pay their drivers double the average, hitting about $30 per hour. A dump truck driver’s salary depends on what company they are driving under, if any, their experience and what they are hauling. Drivers are also eligible for company bonuses and incentives due to the high demand of their service. In 2016, the median pay was $41,340. The median salary in the United States was $37,040, suggesting dump truck drivers make an above-average salary. It’s more difficult to pinpoint the exact salary for being a dump truck owner-operator. Payscale estimates that a dump truck owner-operator can earn anywhere between $40,000 – $197,000. The longer one is a dump truck driver, the more likely one is to make a higher salary. Behind career length, geography is the biggest factor affecting pay. If one owns several trucks, has them working relatively constant jobs and deducts the necessary expenses it takes to run them, the salary range can be easily much higher. However, they are responsible for the care of their trucks. Even if several trucks need maintenance or gas, dump truck factoring can help out by advancing invoices without putting owner/operators into debt. Unlike other types of truck drivers, a dump truck driver’s routes are mostly local. A lot of jobs that dump truck drivers accept are hauling loads from one place to another within a 20-30 mile radius. Instead of traveling interstate to deliver goods, they’re more likely to travel within a specific county’s boundaries. Not having loads that require multi-day travel allow dump truck drivers to sleep in their own beds and be at home with their families instead of out on the road. That may mean a driver is going to take multiple loads per day every day they work instead of taking one load across the country and back. Opportunity knocks often for dump truck drivers. If you’re a new driver, don’t worry. Companies across the country are searching for potential drivers to train by hauling smaller, heavier loads back and forth to places like construction sites. When you accept the job, you’ll most likely be trained in a classroom and on the job. If you’re willing to learn the job, there are many different companies that will still consider your application. If you have a few years of experience, there’s even higher demand for drivers like you. Businesses are looking for people with experience that they can trust to haul what they need. Most dump truck jobs require the operator to also inspect certain equipment, clean and maintain the dump truck, or haul waste. If you have experience doing any or all of those things, you’re already ahead of the game. If you get bored when you’re required to be repetitive, this job might not be for you. If a driver accepts a certain job that lasts 3 months, they’re most likely going to be driving the exact same route several times a day for those 90 days. Driving locally is a huge perk, but if you’re more concerned with the familiar sites than you are with sleeping close to home, this job is perfect for you. Drivers can avoid complete repetition by switching up their simple routes if at all possible. If not, dump truck drivers get to speak to those they’re hauling for several times a day. Make some friends in your field! If possible, it also helps to take a few breaks and walk around outside of your truck. Work can be seasonal depending on what state you live in. A dump truck driver in Florida is going to experience different weather-related problems than a driver in Alaksa will. If your area has bad winters, you may be out of a job depending on your level of experience. Dump trucks are expensive pieces of equipment, so driving them in less-than-perfect conditions proves more of a risk than anything. But, if you are a seasoned driver, or want to be eventually, you may be in luck. A dump truck chassis is the base of certain winter service vehicles, so knowing how to operate one in the winter means you have to use an entirely new skill set. a dump truck chassis is the base of many winter service vehicles, so the ability to operate the truck through all the variables of the job is a valued ability indeed. Since there is a lot of load shifting and the truck is generally pretty heavy, it takes skill to do the precise maneuvers necessary in snow removal. While being lonely is a much bigger problem for long-haul truckers, dump truck driving can still be a relatively isolated job. Working long hours and constantly being inside your truck can be difficult to say the least. To make it a bit easier on yourself, listen to an audiobook or podcast. If music is more your thing, tune into the radio or download your favorite streaming music app to keep you entertained for hours. You can always call a family member or friend if you want to as well. A familiar voice can cure the blues in minutes flat. Regardless of what you do to fight the lonely bug, make sure you’re not driving distracted. Truck driving is a tough job and a huge commitment. But — like any other job — it has its advantages and disadvantages. 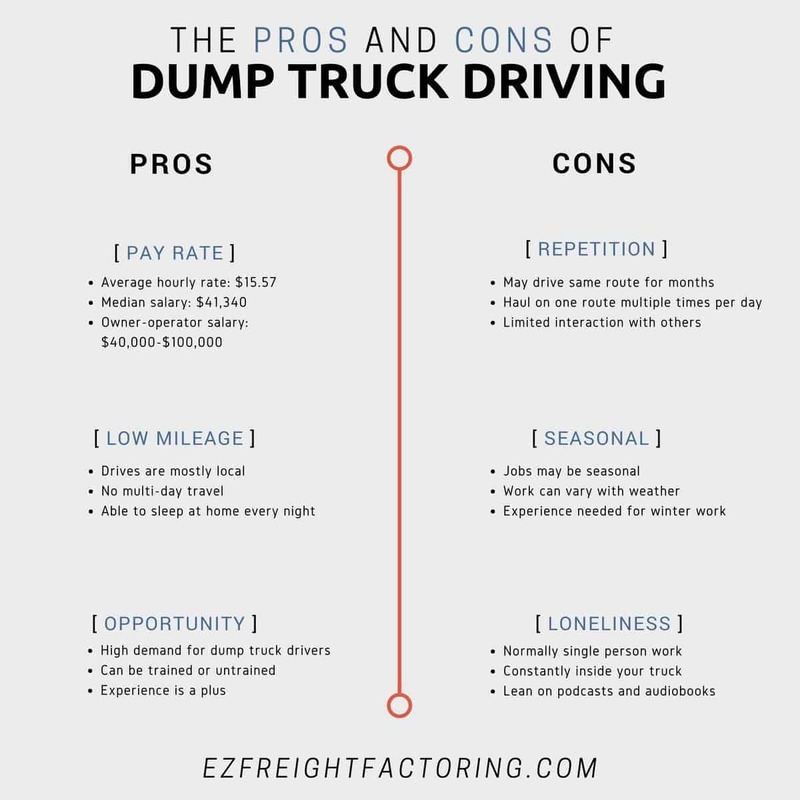 If you decide the pros outweigh the cons, then welcome to the world of dump trucking! The Federal Motor Carrier Safety Administration has suspended the hours of service regulations for truckers in 26 states until the emergency situation in Texas and Louisiana has been declared over or until September 24, whichever comes first. The hours of service rule for truck drivers was first published in 2011 to ensure drivers of commercial or motor vehicles are taking breaks after 11-14 consecutive hours of driving. FMCSA has declared this regional emergency, “in anticipation of a regional shortage of fuel products” directly related to Hurricane Harvey. Hurricane Harvey has disrupted about 20 to 25 percent of the country’s oil refineries and pipelines, causing gas prices to rise. While some of these pipelines have partially reopened, it could be months before operations return to normal at some of the refineries hit hardest by the hurricane. In addition to those affected by Harvey, the threat of Hurricane Irma could wipe out gasoline demand if it impacts Florida this weekend as projected. Besides for the hours of regulation, Florida has also suspended registration requirements for commercial and motor vehicles as well as waived the size and weight requirements for any vehicle transporting emergency equipment, services and supplies. It’s important for truckers to be patient when delivering loads to these areas. The delivery locations may be crowded and unorganized, but helping out those in need by providing them with crucial supplies during tough times is rewarding. With potential victims in mind, the authorities are trying to be as prepared as possible when getting supplies to these areas affect by disaster. Purchasing a used truck can be a much trickier process than simply buying a new one; because a pre-owned big rig already has a history on the road, it is much more important to know the value and specifics of what you are buying before your money changes hands. With this in mind, a wise buyer can get a great deal on a used tractor-trailer so long as they follow the proper procedures for making their decision. Here is a guide to buying a used big rig that will help you get the best deal possible. Just like a house in the suburbs has comparative advantages and disadvantages to a condo in the city, different sizes and builds of trucks can serve entirely different purposes. Regardless of the value, size, or nature of what you intend to be carrying, buying the wrong truck can not only cost you money but also prove completely useless to your business. If you already own a truck and are clear on what you need, further research may not be necessary. On the other hand, owner-operators who are just starting a freight business or trucking companies looking to add another type of truck to their fleet should spend however much time it takes for them to be confident that they know what they must buy. Buying a used semi-truck does not just involve understanding the various types of vehicles available for secondhand purchase; once you have determined what kind of truck you need, the next step is finding businesses selling what you aim to buy. Along with simply viewing the trucks online, it is important to actually go to the dealership where the truck waits to be purchased so that you can take a closer look at what you are about to get. 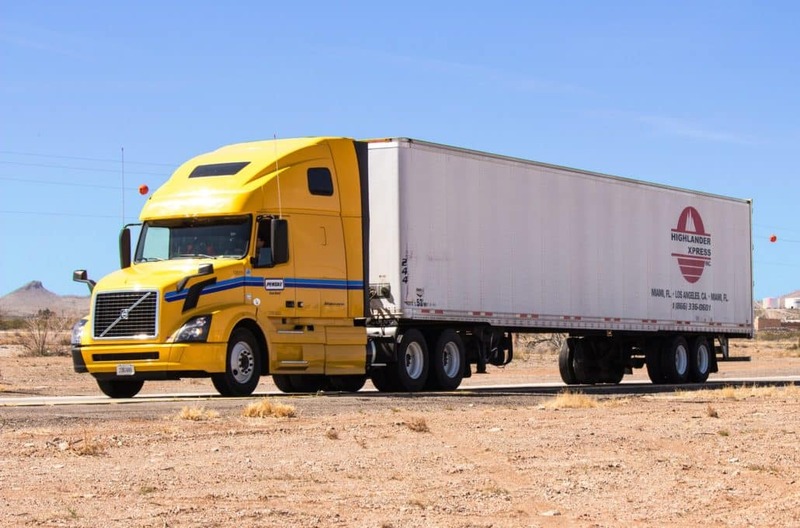 Inspecting a used semi tractor-trailer can be a tedious process, as it involves actually looking at the inside and outside of the vehicle along with checking out the specs on paper. Regardless, pre-owned commercial trucks can be very expensive and it is important to avoid bad surprises – know the history of the truck to ensure that you aren’t buying a vehicle that has been in 20 accidents and is knocking on death’s door. As is the case with most automobile sales businesses, customers should be wary of the fact that the salespeople get commission off of every sale they make. This means that they will often be driven to make a sale even when the product does not necessarily fit the consumer as well as the buyer would hope. This does not mean that buying used big rigs from a dealership is a bad idea, but it does strengthen the argument to be made for doing personal research. Some of the best trucks to buy used can come from pre-owned vehicle dealers, but the high cost of buying a used tractor trailer means that a few hours of learning about the details of a truck that might become yours is well worth the effort. Just like a family of 6 probably shouldn’t have a Mazda Miata as their primary car, buying a used tractor-trailer that you want instead of one that you need can end up being a mistake that becomes very costly over time. If a cheaper or newer truck is smaller than you would like, you will miss out on lots of opportunities to haul lucrative loads due to your lack of cargo space. If the bigger semi looks more comfortable on the inside but guzzles more gas than a small nation, your loads might not be big enough to cover the cost of maintaining and fueling such a monstrosity. Purchasing a used freight truck requires a good business sense and a willingness to keep things objective so that the decisions you are making are those that are best for your business long-term and not impulsive buys that you will come to regret. Deciding where to buy a used semi-truck is just as important as deciding what used-semi truck to buy; if the person that is selling it to you is sleazy, dishonest, or a crook, you are likely not getting your money’s worth (or anything close to it) out of the purchase. As a result, taking advantage of services like Yelp that will inform you as to the history of the seller will undoubtedly help you decide whether or not to buy from them. There is always the chance that the truck has issues that aren’t clear until it actually hits the road, and although there isn’t really a way to prevent this possibility (even when a contract is in place to attempt to dissuade sellers from making false claims), looking at reviews can be a great way to gauge the trustworthiness and quality of the seller from whom you are looking to buy a used semi-truck. The transition of businesses into the digital age has made it increasingly easier to know a great deal about companies and their services, so a smart trucker looking into buying a used tractor trailer will utilize these simple and fast resources. Although the prices on a used truck can be far lower than they would be on a new vehicle, big rig trucks are very expensive regardless. Accumulating enough cash to buy a used semi-truck can be difficult, and taking out loans can put the business owner at risk. If you’re already hauling loads and are ready to buy another big rig, freight factoring can get you the cash you need to help with your down payment. For more information on freight factoring, call Easy Freight Factoring today. 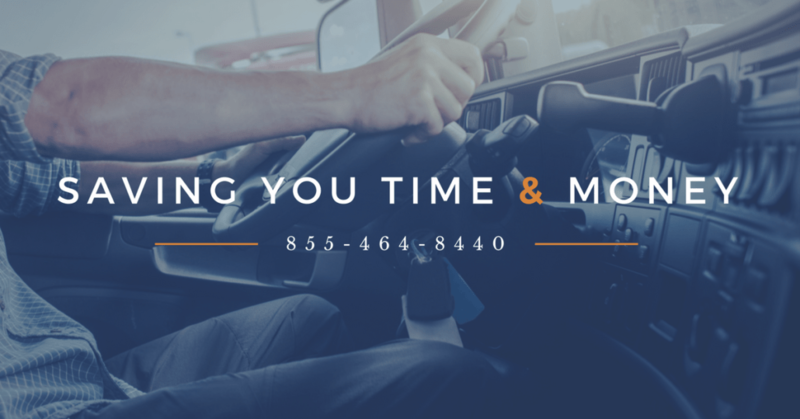 We will connect you with a truck factoring company that can put money in your hands within 24 hours of making a deal. In addition to their safety, truck drivers should be concerned about health and fitness. While taking weeks or even months long trips, there are lifestyle changes that truckers need to follow and make to stay fit. It’s important for truck drivers to ask themselves “How do I stay healthy on the road?” For some, maintaining a healthy lifestyle can be challenging because they may not have the resources that people in other professions have, but that’s not to say that living a healthy life isn’t possible. Choosing to be healthy not only keeps you slim, but keeps your wallet fat. That’s right, staying healthy is a way truck drivers can save money. Follow these 10 tips and tricks to keeping a healthy truck driver diet. Breakfast is the most important meal of the day, whether you’re a trucker or not. According to a study done by Consumer Reports, people who eat breakfast regularly tend to have better diets overall, consuming more fruit, vegetables, milk and whole grains. Eating breakfast increases your blood sugar which gives you energy to start your day. It also prolongs your need to eat lunch and keeps you moving throughout the day, which is important for truck drivers taking long trips. Some healthy and simple breakfast ideas for truck drivers include oatmeal, fresh fruit, protein bars, or a mixture of different breakfast foods. Some OTR drivers suggest eating a larger breakfast, and then smaller portions throughout the rest of the day to stay healthy, while avoiding hunger. Eating leafy greens two times per day will increase your focus on the road. Leafy greens are a good source of Vitamin K which prevents certain age related conditions. They also help lower cholesterol and preserve your vision, an important aspect for truckers. Not drinking enough water can affect a driver’s alertness on the road. Drivers should be drinking at least 64 ounces of water per day to make sure their bodies are functioning to their full potential. Coffee may help truckers stay awake, but consuming too much caffeine isn’t good for anyone. Following all of these other steps while getting an adequate amount of sleep should reduce the need for a lot of coffee. However, two cups of coffee per day is acceptable for drivers to take in. Soda dehydrates the body and is bad for your teeth. There are so many healthier beverage options including water, juice and tea. Not only is water the best option for hauling loads because it keep you hydrated, water keeps you feeling full longer. If you feel full while you’re driving, you won’t need to stop for food as frequently, saving you time. Truck drivers should sleep for at least 7 hours per day in a dark and quiet place. According to the Federal Motor Carrier Safety Administration, 1 in 5 deaths on the roadway are caused by drivers who fell asleep while driving. Sleep is the key to health and safety, especially if you’re working long hours as a truck driver. To avoid restlessness while driving, take a short break every two hours. Pull to a rest stop and grab a snack or just stretch your legs and do some simple exercises. Small breaks every two hours can revamp your drive and give you more energy. You can take a few minutes to just touch your toes, roll out your neck or even do some jumping jacks to get your blood flow circulating properly. No matter how important a load, truck drivers shouldn’t neglect their health and fitness. Following these tips and health guidelines should be an easy way for truckers to contribute to healthy living. In September of 2015, U.S. Representative Reid Ribble (R-Wisc.) sparked controversy within the trucking industry as he proposed an increased weight limit for six axle trucks on American federal interstate highways, suggesting that the current 80,000 lbs. limit be raised to 91,000 lbs. The proposal was introduced in a version of his proposed Safe Trucking Act. Ribble believed that raising the federal weight limit would increase industry-wide productivity and improve highway safety, overall, as fewer trucks would be on the road. Today, Ribble and others are still calling for the weight limit increase. Why do Ribble and others want the change? Supporters of the movement point out the numerous safety benefits of having less semi-trucks on the road. Commercial actors are excited about the increased efficiency in transportation. Practical proponents also point out that, in most states, it is commonplace for trucks to surpass the 80,000 lbs. standard while on local and state-operated roads, and that upping the weight in the average truck would come at no cost to the government— the Department of Transportation has confirmed that such an increase would not place any additional stress/wear and tear on the interstate highway, giving the initiative additional credibility. Since 2015, the issue has been raised repeatedly in Congress. It has the backing of several interest groups in the transportation industry, such as the Coalition for Transportation Productivity. 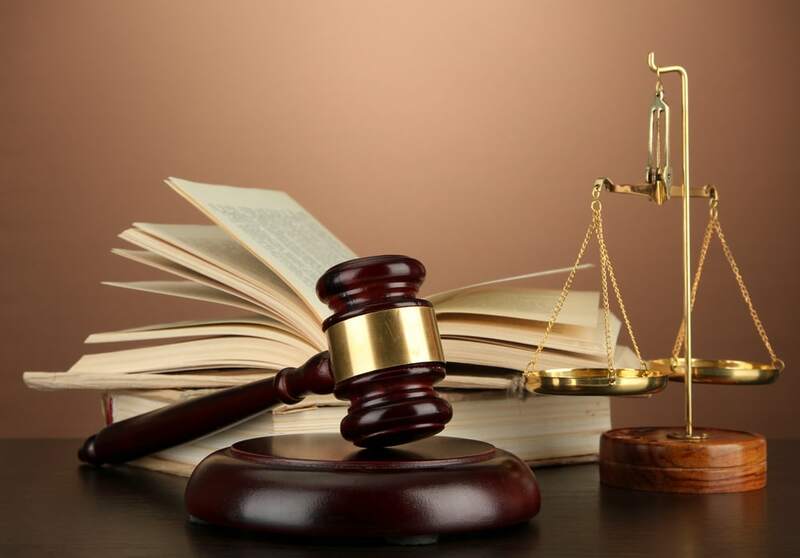 The American Trucking Associations also backs the bill, while other prominent groups, such as the Owner-Operator Independent Drivers Association and the Truckload Carriers Association (TCA), do not. Why Does the TCA Oppose the Increase? The TCA is opposed to the bill because, as they see it, changing the maximum weight of six axel trucks would essentially cause a de-facto mandate for all fleets to update their equipment—any truck with fewer than six axels will become instantly obsolete, inefficient. Retrofitting current fleets that aren’t capable of hauling 91,000 lbs. would be an expensive undertaking. Many small trucking fleets don’t have the cash to drop everything and make the upgrades. Why is this a problem? In not upgrading their fleets, they would hardly be able to keep pace with their competitors that can retrofit their fleets and haul more freight—after all, which business wouldn’t chose the fleet that can haul 91,000 lbs. of cargo? The six axel trucks, which could carry an additional 13.75% of a typical truckload, would totally wipe out all of their less efficient competitors. Companies would have to hire less trucks in order to transport more freight, and those that cannot keep with the times would quickly go out of business. The TCA has recently written Congressmen/women, imploring them to table the conversation of raising the weight maximum for interstate trucking. So far, it is unclear how the entire drama will play out. Anyhow—if you do not have a six axle truck, you may be facing an upgrade, if legislation raising the weight maximum passes. Do you have the cash flow on hand to cope with the changes that will become necessary? Do you currently have the cash flow to shoulder unexpected expenses? If not, give us a call—we offer a score of services that are intended to help small trucking fleets/owner-operators like yours increase their cash flow, avoid debt and expand. Driving an 18-wheeler across the country can be exceptionally difficult during the winter months. Major snow and ice storms can be very dangerous for truck drivers to venture into to deliver their loads from place to place. It’s important for truckers to alter their driving to be extra cautious during dangerous conditions. Good maneuverability skills can save your life when sliding down an icy hill or off of the road. There are many risks involved when driving in bad weather and knowing conditions are unsafe makes all drivers on edge and more cautious. Some of these risks include reduced visibility, icy roads, snow drifts, more ‘stop time’ and the unpredictability of other drivers. Truckers must be smart and know when they can push through to keep driving or when the conditions are too bad and they must take a break. Drivers who choose to be on the road during bad weather are not only putting their own lives in danger but other drivers as well. Separate yourself from the rest of the pack by considering yourself a professional. Professionals exercise preventative safety skills to protect themselves and others at all times while on the road. Refresh your memory of these 10 basic safety tips to be extra safe this winter. Always be prepared for winter weather and any challenges that it may bring. Make sure to have an emergency kit in case you get stuck or stranded in freezing temperatures. Blankets, extra warm clothing and coats, a flashlight, healthy and energizing food, water, windshield washer fluid, ice scraper, jumper cables, traction mats and at least a half a tank of gas at all times. If you do happen to get stranded, it’s always best to stay in your truck until help arrives. Always have a plan on what to do if you run into this type of problem while driving through a winter storm. It’s important not to drive too close behind other drivers all the time, but especially in winter weather conditions. If the person in front of you comes to a fast stop, you may rear end them if you are following too closely behind. It’s often difficult to stop quickly when driving on snow and ice (slippery conditions), but keeping a safe distance in between you and other drivers helps to prevent accidents in snowy weather. To ensure that other drivers are not tailgating you, make sure your trailer lights are not covered with snow or ice, decreasing visibility of you to other drivers. Always check your taillights before leaving a rest stop and keep tools handy for when you may have to dust them off. Not only is it helpful for other drivers to see your back lights but it’s the law as well. You can get pulled over and sighted if your rear lights are not visible. Bridges always ice faster than the normal roadways because the freezing air surrounds the surface from above and below. Bridges have no way to trap heat so ice forms extremely fast. Roads only loose heat from the top surface and will not ice as fast as open bridges. Drivers should be extra cautious when crossing a bridge in winter weather conditions. Even if it’s a sunny day and the roadways just look wet, be cautious of black ice at all times. Altering your normal driving speed during winter conditions is always a good idea. Driving at a slower speed will give you more time to react if something occurs. For example, if you were to start sliding or hit a snow drift, you’ll be able to maneuver your truck better the slower you are going. Road rules and speed limits are important at all times, especially when driving conditions become more dangers. Speed limits are set because those rates were tested and determined safe for drivers. Other road rules such as using your blinkers and passing are important in blizzard conditions as well. Especially when visibility is low, never stop on the shoulder of the highway. Other drivers cannot see you or may mistake you for a moving vehicle and can easily run into you. It’s best during the winter months to pull into a designated rest stop or get off at an exit if possible to keep you and other drivers safe. If you’re debating getting off the road, you probably should. Driving in a snow storm can make visibility extremely low and you don’t want to put yourself or other drivers in danger. Stopping for a few hours to wait out the storm is worth it. Be sure to listen to weather reports and warnings and use your best judgement. Also, if you decide to stop, make sure your vehicle is equip with anything you might need to wait it out. You probably learned this back in the day, but it’s always good to have a reminder of safe truck driving practices. The jake brake is a good tool to use to slow down in normal conditions, but not on snow or ice covered roadways. When your trailer is not straight on the road, too much breaking can cause it to spin out of control. You can be cautious at all times but an accident can happen in the blink of an eye from another driver’s actions. Radioing to other truckers that you are going to pass them in snowy conditions is a common courtesy that others will appreciate. If visibility is bad you may want to drive with your hazard lights on so other drivers can better see you. Professional truckers are always prepared for winter weather conditions, but use these 10 tips as a reminder of how important it is for truck drivers to plan ahead for the winter months. If you are in need of financing for your trucking receivables, contact Easy Freight Factoring for a free quote today. We help factor freight receivables for trucking companies of all sizes. Give us a call at 1-866-780-0916. Uber is a name known across the country as the savior for needed car rides, and more recently, food delivery. Now, Uber is trying to conquer the trucking industry. On December 26th, Uber launched a new site, Uber Freight. The site leaves a lot of questions unanswered as it only features a moving picture of a truck, and a place to enter an e-mail for shippers and carriers. Carriers can sign up to carry, and shippers can send their freight without needing long term contracts. The work in progress company called Otto, features self-driving trucks that may be making a partnership with Uber far into the future. Self-driving trucks and cars have been a popular topic of discussion between big companies like Google, Amazon, and the like. While there is still work to be done, both Google and Otto have had self-driving vehicles on the road in recent weeks. In October, Uber promised to have self-driving Otto trucks on the road by 2017. When that will happen is still up in air. For now, Uber Freight will be operated by real drivers. Then self-driving vehicles will start to “learn” from experienced drivers with their advanced technology. While the thought of autonomous trucks on the road seems like a very real thing for the future, there are some hurdles to overcome. One large one, being the government. The government will have to figure out exactly how to regulate these self-driving vehicles. It is worth noting, it will be a long time before these self-driving cars will actually be driving solo. There will be a lot of software training with an accompanying truck driver in tow. For now, truck drivers don’t need to worry. Otto trucker will still need to be monitored by a human. Instead of driving, the trucker can work as an operator for the Otto truck, ensuring it makes it to its destination. Besides government hurdles, there are still errors to overcome in the Otto trucks. To name a few, their struggles are changing lanes at slow speeds, and seeing red lights. With that being said, winter weather conditions and out of the normal happenings such as a car explosion could throw off the cars/trucks very easily. It’s a long road ahead. Uber’s CEO, Travis Kalanick, says that Uber Freight is going to save trucking companies time and money by having real-time pricing, cutting out the middleman of a freight broker. Uber Freight delivered it’s first truck of freight last week. 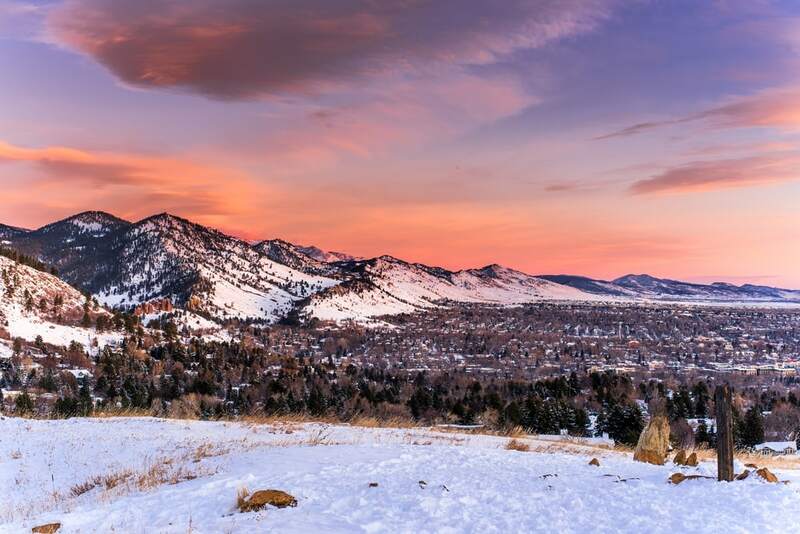 It was a load of beer going from Fort Collins, Colorado to Colorado Springs which spanned 120 miles. The self-driving vehicles stress their ability to see what humans can’t. What Does This Mean for Your Trucking Business? Don’t worry. Human truck drivers are far from gone in the early stages of the autonomous merge. With the New Year coming up, you may need more working capital than ever with increased online shopping. Get fuel advances, fuel cards, and funds to pay your drivers with factoring. We can get your trucking company set up an a factoring company that can offer advanced payments in less than 24-hours. Give us a call to get started.